Now with the dengue alarm which has reached outbreak proportions, there has never been any better tip in preventing the disease and dengue proofing the family than starting with the self. Now, parents who are protective of their kids go extreme lengths to keep their kids, especially when away from home, safe from mosquito bites. Enter, the leggings and mosquito repellants. But, did you know that all those who protect themselves from dengue mosquito bites by wearing leggings are still not dengue-safe? 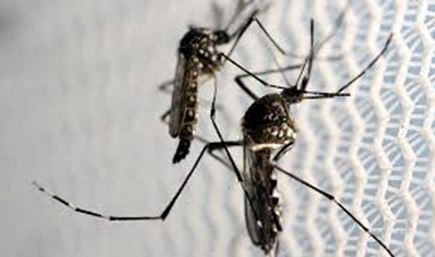 Dengue mosquitoes, or aedes aegyti which causes the transfer of dengue virus to humans use sight, smell, and heat to find a blood meal, and gravitate around human and animal heat, that even with leggings, mosquitoes can still go for exposed parts of the body. More-over. leggings, or at least those kinds that pupils are now wearing in schools are those thin types, ones that mosquitoes can still, easily bite through. “What we want to avoid is the mosquito bites, and leggings, or at least those that a mosquito can bite through, are still a concern,” shared a pediatrician who politely declined to be named. And then there is the color. “There have been circulated tips that mosquitoes are more attracted to that dark colored clothing, the color for most of the leggings that kids use, and these could be attracting more the mosquitoes that we want these insects to move away from our kids,” the pediatrician continued. Over this, wearing of bright colored long-sleeved clothes and trousers that mosquitoes could not bite through, something that lower the chances of getting bitten by dengue-carrying mosquitoes, is still the best. “Ensure that your kids wear clothes that cover as much skin as possible especially when they are going outside to play,” the children’s doctor said. On the exposed skin, mosquito-repellants could be of huge help, she stressed. Dengue mosquitoes accordingly bite early mornings and evening before dusk so these times are perfect time for mosquito repellants. Also, observers said keeping bug repellent machines could keep the mosquitoes away. Some electronic machine repellents uses ultraviolet light that attracts mosquitoes to some zapping mechanism in that contraction that kills mosquitoes, bugs and even moths. But, as to mosquito repellants, think of this: Not all kinds are set for just anybody. Experts in skin care recommend those that are effective, safe and have skin-friendly ingredients, especially for pregnant and breastfeeding women. Generally, ingredients like DEET and IR 3535 are safe to use even for pregnant and breastfeeding women, research showed. DEET (N,N-diethyl-3-methylbenzamide) is effective for exposed body parts and has been declared as safe for infants older than two months and children, just make sure to keep children from ingesting these repellent. But, one should always apply the repellent as advised in the instructions and adults must apply repellants on children ensuring to avoid their hands, eyes and mouth as this can cause mild irritation, itching, skin eruptions, and rashes manifest. On the other hand, insect repellent 3535 or IR3535 is a synthetic product. Its ethyl N-acetyl-N-butyl-ß-alaninate which is powerful in repelling biting flies, mosquitoes, and deer ticks and still gives one a good feeling on the skin. And when most think repellents are okay for anyone, babies younger than 2 months must not be applied with these. Also, repellants containing ingredients like lemon eucalyptus (OLE) or para-menthane-diol (PMD), these should be avoided for children under 3 years. Apart from anything, ridding the house of stagnant water already effectively keeps mosquitoes away. Household items like bird baths, bowls, flower vases and other utensils that contain water should be changed regularly so mosquitoes would have no place to breed. To get rid of mosquitoes, remove their entire breeding habitat which includes stagnant water, or cover all water containers and remove sources which can even remotely be related to breeding habits of pests. Check for damp areas in your home. Check refrigerator drains, coolers, dish basin, racks for mosquito breeding sites and always keep the toilet bowls, trash bin covered and never let wet waste accumulate near your home. For containers, keep them to avoid water accumulation. That is not enough though. People must ensure that these items are cleaned and scrubbed to remove any eggs that may have been laid out by the mosquitoes. Covering open water tanks and buckets is still a sound dengue prevention tip as it reduces the risk by eliminating any possible breeding grounds. For rooms and houses, doors must be closed and window screens installed, to prevent the entry of dengue-carrying mosquitoes. Moreover, mosquito nets are still effective, especially if these are applied with long lasting insecticides. In the dark corners of the house, spray pesticides especially in the potential resting places for mosquitoes. And in cases when a family member gets a fever that has been recurring for over a day and paracetamols seem to be ineffective, hurry to the nearest medical facility. Or if you happen to be far from the hospital, keep the patient hydrated. Let him take in a lot of fluids, oral rehydration salts, something to temporarily keep him up and about while on the way to the hospital. DOST Secretary Fortunato T. de la Peña and DTI Secretary Ramon M. Lopez sign the MOA in the presence of (from L to R): DTI Assistant Secretary Demphna Du-Naga, DTI Undersecretary Zenaida C. Maglaya, and DOST Undersecretary Brenda Nazareth-Manzano. 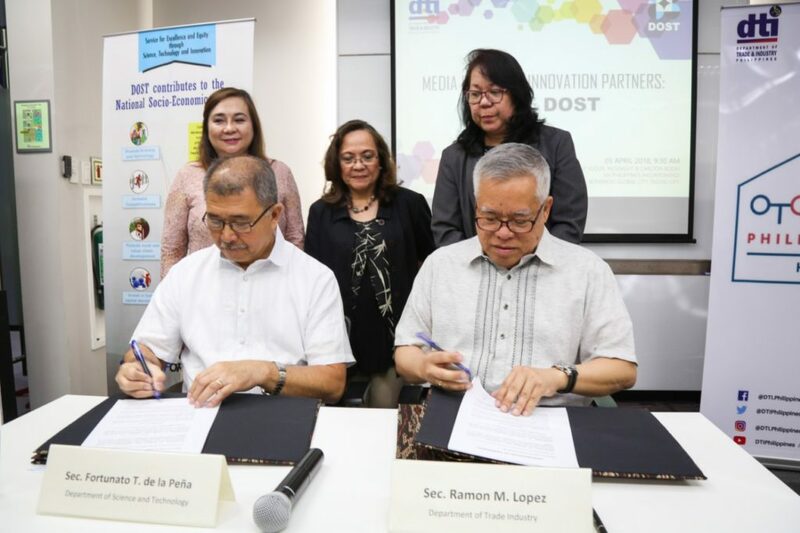 TAGUIG—Department of Trade and Industry (DTI) Secretary Ramon M. Lopez and Department of Science and Technology (DOST) Secretary Fortunato T. de la Peña signed an MOU to promote Filipino innovation, or “Filipinovation,” for entrepreneurs. MSMEs comprise 99.6% of enterprises and 70% of employment in the country, but only account for 35% – 40% of Gross Value Added contribution to the economy. Sec. Lopez said innovation can bridge this gap because when MSMEs transform raw materials into quality products, they can sell at premium prices and reach international markets. 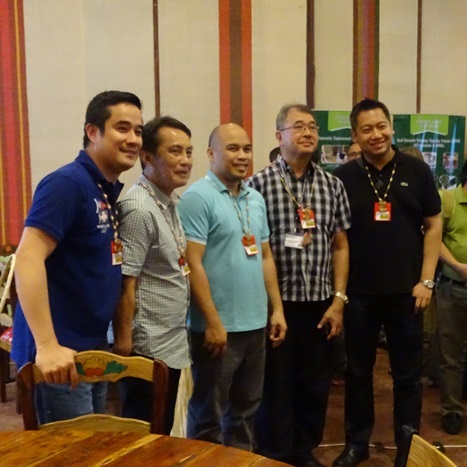 Go Lokal!, a project that discovers and improves MSME products and helps them reach mainstream markets. DAUIS, Bohol, May 4 (PIA)—The Congressional Committee on Science and Technology successfully held here the public hearing by the technical working group on the proposed laws strengthening the Provincial Technology Centers as well as attuning the Philippine standards to the world measurements. During the public hearing held at the Bohol Bee Farm in Dauis Bohol, committee chair and Bohol Congressman Aristotle Aumentado said the public hearing is a mandatory process before both proposed measures can be calendared in the house for deliberation. Foremost among the proposed measures is the packaged strengthening of the Department of Science and Technology’s (DOST) by putting a better manned Provincial Science and Technology Centers (PSTC). The premier science and technology agency in the country mandated to provide the central direction, leadership and coordination of all science and technology activities by formulating policies, programs and projects in support to national development, the DOST is composed of two advisory bodies, 4 sectoral planning councils, 7 research and development institutes and 8 science and technology research institutes. The DOST’s most visible science and technology service institutes include the Philippine Atmospheric Geophysical Astronomical Services Administration (PAGF-ASA), Philippine Institute of Volcanology and Seismology (PHIVoLCS), Technology Application Promotion Institute, Science and technology Information Institute, Science Education Institute, Philippine Science High School System, Technology Transfer Center and the Information and Communications Technology Office. Interestingly however, in a presentation, the DOST’s frontline service providers in the provinces; its PSTCs are not only ill manned, it is also dumped with the tasks of implementing flagship projects especially on the assistance to small and medium enterprises. No less than Department of Science and Technology Secretary Fortunato dela Peña, who stressed the role of science and technology in a developing society, pointed out the huge disparity between the government trade agency staffing as against the DOST. During the public hearing, reacting to the presentation by DOST Bohol chief Engr Marcial Tanggaan, Sec dela Peña cited the three Bohol staff tasked with the DOST mandates as clearly wanting manpower. The measure then presented by the TWG proposed for the upgrading of the PSTC positions and appropriating funds thereof. On the other hand, other proposed bills presented included strengthening the National Measurement Infrastructure System (NMIS) which amends the National Metrology Act of 2003. The move assures the integrity of measurements in the country that it meets in the regional and international standards while promoting the harmonization of the national requirements, technical regulations and standards and conformity assessment procedures. This is also especially with the broadened markets as envisioned in the ASEAN Economic Community, World Trade Organization and other international agreements that redound to the freer flow of goods and services as well as better trading environment, DOST sources said. When made into a law, the NMIS puts up the National Measurement Institute of the Philippines as the country’s national metrology institute which would be a DOST-attached agency tasked to keep and maintain national measurement standards for the Philippines, facilitate international harmonization and measurement compatibility.